"The bright, zesty flavor in this recipe comes from fresh lemons. 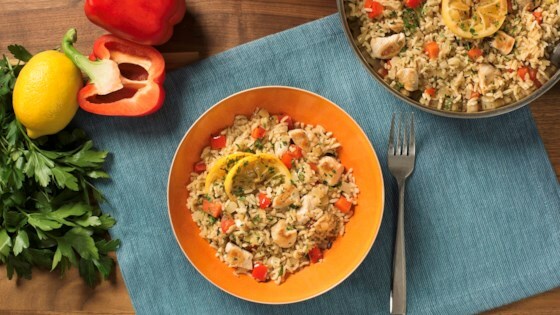 When you combine that flavor burst with savory chicken thighs and our rice, you get a hearty, easy-to-make meal your family will enjoy over and over." When chicken is browned, add lemon slices, onions, and red bell pepper. Then continue to cook for 2 to 3 minutes. Remove lemon slices and put them on a plate for later. Stir in UNCLE BEN'S(R) Flavor Infusions Roasted Chicken Rice and water. Bring to boil, then reduce to medium heat and simmer covered for 15 minutes or until water is absorbed. Stir in lemon slices and garnish with parsley. Enjoy! We really enjoyed this easy one pot dish. I would have never thought to add lemon to a dish like this but was pleasantly surprised by the addition. Overall everyone was pleased. This was such a nice homey meal that was so quick and easy! I really wouldn't change much other than a bit of salt and pepper while sautéing the chicken. This new rice blend is a keeper!! !